In case you missed it, in October of last year, Adapteva wrapped up a successful Kickstarter campaign to build a Raspberry Pi-inspired $99 Linux supercomputer. The campaign was successful in raising $898,921 for the first versoin of the Parallella computer, a supercomputer equipped with a dual-core ARM A9 processor and a 16- or 64-core Adapteva floating-point accelerator. Quite a few people have questioned this idea, but it's actually quite interesting and could usher in the era of grassroots supercomputing. Adapteva's CEO Andreas Olofsson has recently been shedding more light on the project. 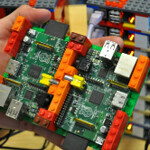 People have been doing lots of tinkering with the Raspberry PI devices, and last year, news came from the University of Southampton that Professor Simon Cox and his team of researchers had lashed together an actual supercomputer made of 64 credit card-sized Raspberry Pis using Lego pieces as the glue for the cluster (see the photo above).